On a night in 2010, a crowd of onlookers gathered to watch the demolition of a 300 metre wall of the century-old Purdu prison in Kuala Lumpur, Malaysia's capital. Among those who had been most vocal in their opposition to demolishing the building were many Malay radicals who had been jailed during the struggle to free their country from British rule from the 1930s until independence in 1957. In Radicals, Syed Muhd Khairuddin Aljunied, associate professor in the Department of Malay Studies at the National University of Singapore, tells the story of these freedom fighters. Such stories are usually sidelined in favour of the dominant narrative of Malaysia's United Malay National Organisation (UMNO), the main party in the conservative ruling Barisan Nasional (BN) coalition. From the 1870s until the 1920s, the seeds of radicalism were planted in Malayan society, starting with a failed anti-British uprising in 1875-76. After the British crushed this rebellion, its leaders were hanged or exiled. A leader of the failed rebellion, Maharaja Lela, served as an inspiration for future Malay radicals due to the telling of his story by professional storytellers (penglipur lara) who travelled from village to village. Often told in poetic rhythms accompanied by music and dance, the penglipur lara told the tale of a local martyr who died defending his land. The story of the crushed anti-British rising in Perak travelled far and wide across the Malay Peninsula. Further rebellions broke out in 1876, 1891-95, 1915 and 1928. Each were crushed, but provided an inspiration to the cause of Malay radicalism. The Malay radicals found inspiration from a variety of sources throughout the world. One was the modernising movement led by Kemal Ataturk who created the Turkish Republic after the collapse of the Ottoman Empire. The nationalist non-cooperation movements against British rule in India and Burma were also a source of inspiration. But the most important source was the Indonesian nationalist movement's struggle against Dutch colonialism. Java and Sumatra were also seen as a second home to Malay radicals, who dreamed of uniting Malaya, Singapore and Indonesia into one union known as Melayu Reyu. Many Indonesian anti-colonialists also fled to Malaya after a failed uprising against the Dutch in 1926. The Great Depression hit every community in Malaya badly. Urban and rural Malays lost large tracts of land. Tin miners and rubber plantation workers lost jobs in large numbers. In the wake of this, some Malay radicals formed the Kesatuan Melayu Muda (KMM) in May 1937 in the Kuala Lumpur home of Hassan Mannan, a prominent radical leader. Inspired by a mix of Malay nationalism, socialism and Islam, the KMM aimed to mobilise the Malay working class and peasants to free Malaya from colonialism. They sought to dismantle the monopoly over power held by an alliance of colonial forces and feudal elite — and provide opportunities for all Malays to own land and gain education. The Malay radicals believed this could only be achieved by replacing British and Dutch colonialism with Melayu Raya — reviving the past glories of the old Malay kingdoms. The KMM grew slowly in years leading up to 1941, by which point they had 150 members and branches in Kajang, Perak, Pulau Pinang, Trengannu, Kelantan, Kedah, Pahang, Singapore, Malacca and Johor. One of the reasons for the slow growth was the hold of the aristocratic elite over Malay society. However, the radicalism of the KMM opened up many new spaces in politics, especially for women. In December 1941, the Japanese invaded and within months had conquered all of Malaya and Singapore. The British Empire's defeat stirred hopes for Malay radicals that the Japanese would give Malaya its independence. From February to June 1942, support from the Japanese authorities allowed KMM membership to leap to 10,000. However it soon became clear that the Japanese were not interested in granted Malayan independence. The KMM was among the groups the Japanese rulers dissolved in June 1942. The Japanese occupation presented Malay radicals with difficult choices. Many chose to collaborate with the Japanese in order to spread nationalist ideas, joining groups such as the Giyu Gun (Volunteer Army) set up in December 1943 under Japanese sponsorship. However, Malay radicals also saw the brutality of the occupying forces — especially its secret police, the Kempatai, who subjected Chinese, Malays and Indians to torture. Many Malay soldiers who had fought the Japanese invasion were sent to labour camps for construction and railway projects. For many radicals, it seems the decision to collaborate with the Japanese was a pragmatic decision. Some Malay radicals did make links with the predominantly Chinese resistance group, the Malayan People's Anti-Japanese Army (MPAJA). Led by the Malayan Communist Party (MCP), it fought the Japanese occupation from the start. Some radicals, such as Ibrahim Yacoob, tried to hedge their bets on both the MPAJA and the Japanese occupiers. However, most of the Chinese community, who suffered worst under Japanese rule, viewed Malay radicals as collaborators. When the Japanese surrendered in August 1945, many MPAJA guerrillas killed collaborators, leading to communal killings between Chinese and Malays. However, throughout the Japanese occupation, many Malay radicals used poetry and stories to develop nationalist ideas while appearing ostensibly loyal to the Japanese. The immediate post-war period lead to an upsurge of political activity. 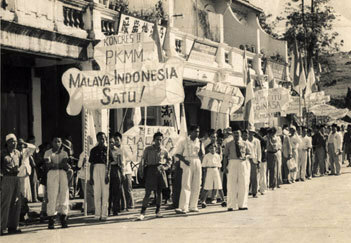 From November 30 to December 3, 1945, Malay radicals organised the first congress of the Malay Nationalist Party (PKMM). The PKMM drew in different classes in Malay society. At its founding congress, Communists, Islamic preachers, socialists, royalists and students agreed to work towards Malayan independence and support the Indonesian struggle against Dutch colonialism. Crucially, the Malay radicals were willing to work with the non-Malay left, especially in trade unions and political parties such as the MCP and the Malayan Democratic Union. One area where the Malay radicals collaborated fruitfully was in the Pusat Tengara Rakyat-All Malaya Council of Joint Action (PUTERA-AMCJA), which organised a Peoples Constitution in 1947 that granted equal rights to Chinese, Indians and Malays. The group was able to shut down Malaya and Singapore on October 30, 1947, in a hartal (strike). By the end of 1947, the PKMM peaked at 54,000 members, competing with the more conservative aristocratic UNMO for support in Malay society. Among the groups that played a very active role in this period was the women's organisation Angkatan Wanita Sedar (AWAS). However, after colonial authorities declared the Malayan Emergency in 1948 in response to an MCP-led anti-colonial insurgency, the Malay radical movement went into decline. A third of its core membership had been jailed by 1949. About 1000 radicals went into the jungle to fight with the MCP guerrillas, others went into UNMO, but most retreated from active politics. Those activists who were jailed carried out political struggles and hunger strikes in prison. But by 1955, UNMO, working in alliance with the conservative Malayan Chinese Association and Malayan Indian Congress, won all but one seat in the Legislative Assembly. By the time independence was declared in 1957, UNMO was well and truly the dominant party in Malayan society. UNMO's communal based approach to politics continues today through the ruling Barisan National (BN). The progressive alternative offered by the Malay and other radical movements was never able to regain their peak position from the mid-to-late 1940s. Syed's account of the Malay radical movement traces the development of the Malay radical movement from the late 19th century through to the formation of the KMM in 1937, the difficult choices faced during the Japanese occupation, then the post-war upsurge. Syed highlights the role that women's organisations, such as AWAS, played in this period. Finally, he shows how the radicals struggled to keep their cause alive in the post-1948 period — fusing nationalist, socialist and Islamic ideas to seek to mobilise the Malay masses for freedom, at great cost to themselves. Radicals provides a vital alternative to the UNMO-dominated narrative of Malaysian history.